I was so touched last week to receive such kind words of support and love. Sharing such personal aspects of my life with you all was both difficult and healing. Thank you for taking the time to share your thoughts, advice, well wishes and such. I realize that although I have some pretty severe pain issues that make daily life quite challenging at times, I am thoroughly blessed and filled with gratitude to have the relatively good health that I do. My journey to finding whole wellness and being pain-free is likely to be a long one and having support along the way is helpful. I appreciate you all!! 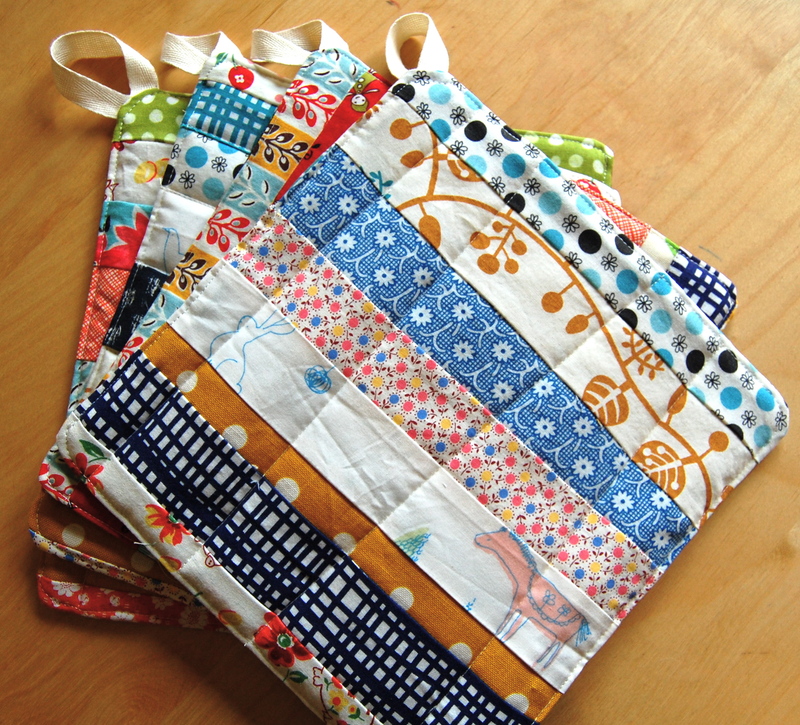 That said, I wrote another post a couple of weeks back about some hot pads/pot holders that I made as teacher gifts. I promised a tutorial on it, so here it is…..
I’m happy to share a quick and easy tutorial for making a very useful kitchen item. 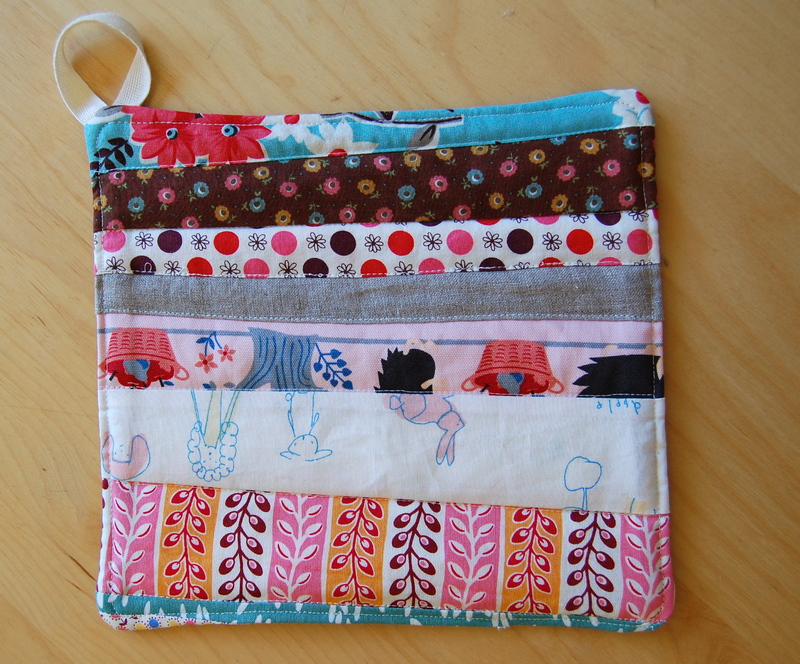 I have such a hard time paying $10 or $20 for the factory made type, when I can use up scraps of my favorite fabric and some of my leftover batting (unless I choose Insulbrite) to create my own. The following tutorial is for a super simple and sweet 9.5 inch pot holder with a loop for hanging. I realize that for those who sew often, this tutorial is likely unnecessary. 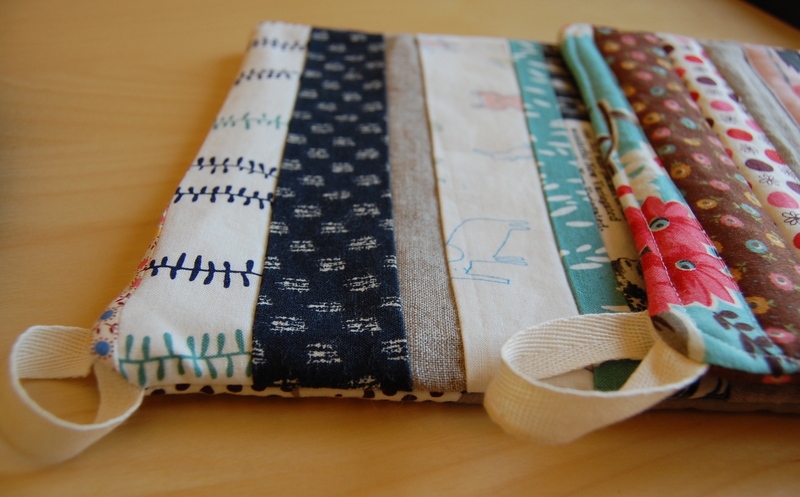 If however, you are a beginner who knows nothing to very little about sewing, you will hopefully find this helpful. I know that even the simplest of projects can seem challenging if you’re just starting out, so you’ll see I added lots of detail! Please know that I created this sample as a 9.5 inch square, however there is no “Hot Pad Police” that says what size they must be. So if all your favorite scraps happen to be only say 6.5 inches long, that could make for a smaller hot pad!! I have made them in several different sizes and shapes, as long as they are still big enough to do the job, that works! Okay, so here goes….. Layout your strips in the way that looks good, is balanced or just plain fun to you. You could color coordinate your scraps or just close your eyes and pick strips. Again, there is no right or wrong, just whatever works for you! 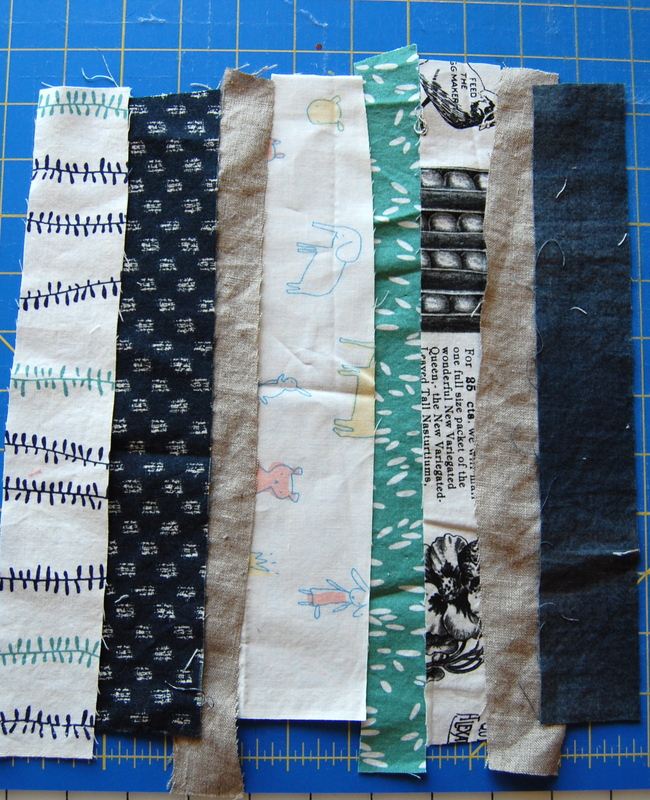 Once you have a layout you like, place two strips, right sides together and sew together using a 1/4 inch seam. Continue this step until you have enough to cut to the desired size, in this case 9.5 inches. I don’t press until I have sewn them all together but you could press after each seam if you like. Press all seams to the side or open whichever you prefer- I generally try to press to the darker side. You should have a rough square that looks something like this. 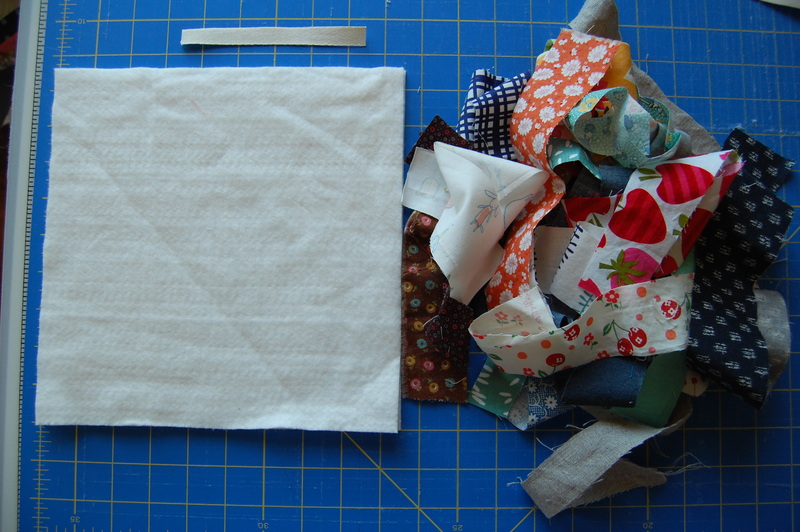 Using a quilting ruler or a 9.5 inch square template ruler, square up your piece to make a clean 9.5 inch square. Now take your top strip pieced square and your 9.5 inch backing piece (in this case, the gray DS Flea Market Fancy print) and place them right sides together on top of your batting square/s. I use two pieces when using the cotton batting and one piece if I’m using the Insulbrite. If you wish to add a hanging loop, take your 5 inch piece of twill tape or other appropriate material and create a loop. 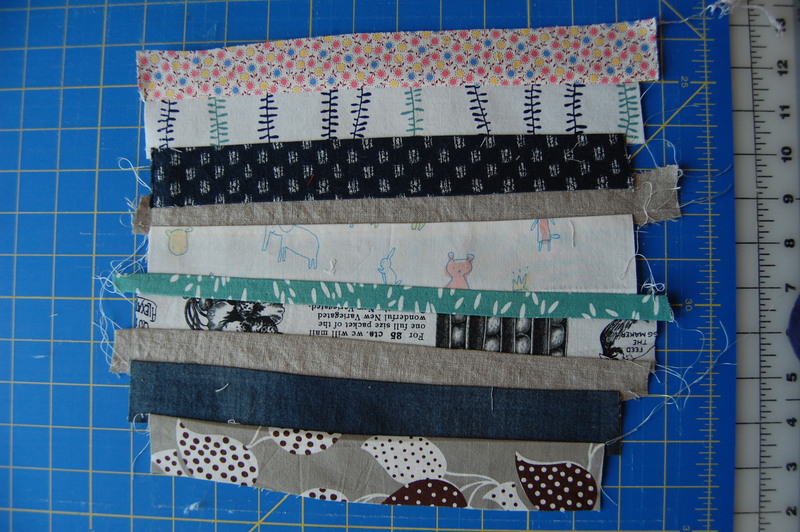 Then pin this loop to any corner (I have recently started putting my loop at the top), paying attention to how you want your strips to orient when your hot pad is finished- vertical or horizontal. Make sure it’s inside the hot pad. You should only see the two ends peeping out at the corner. Pin in place (sorry for the blurry photo). 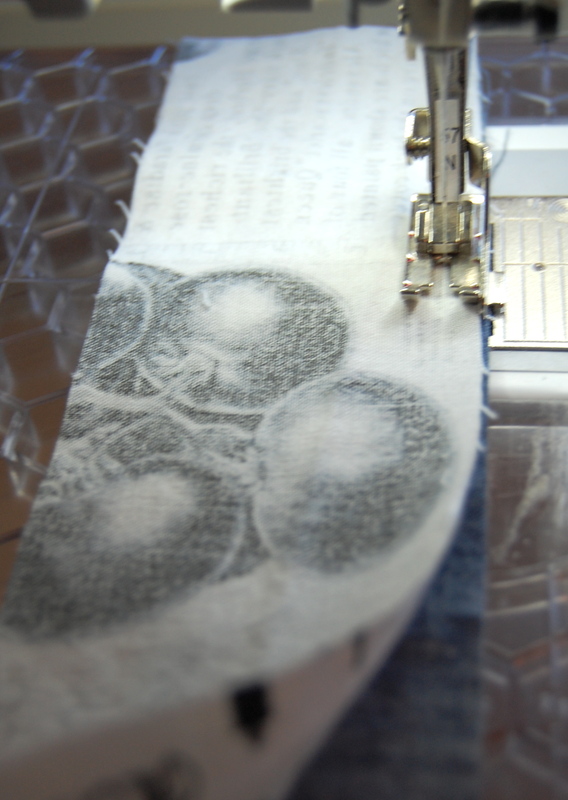 Be careful when sewing around your hot pad, that you don’t catch the sides of your loop….. I speak from experience on this one :-)!! After Step 6 you can do a little diagonal stitch in this corner to secure the loop before turning right side out! Pin your pieces in place leaving about a 4 inch opening on the side that runs parallel to the strips. I use about a 5/8 inch seam allowance here. 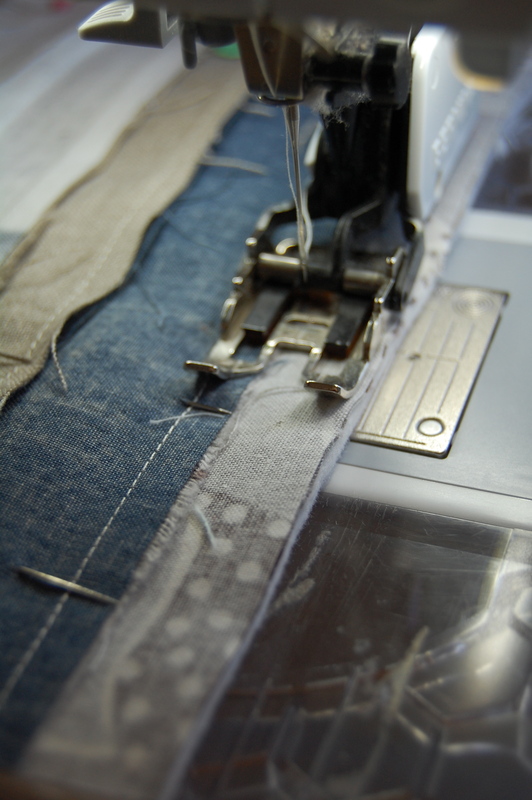 Using your walking foot and starting from the bottom part of your opening, sew the pieces together. I use a 5/8 inch seam allowance here. Be sure to stop at the top of your opening. I usually do a backstitch here. Snip your corners with your rotary cutter, leaving a 1/4 inch. Then turn right side out. 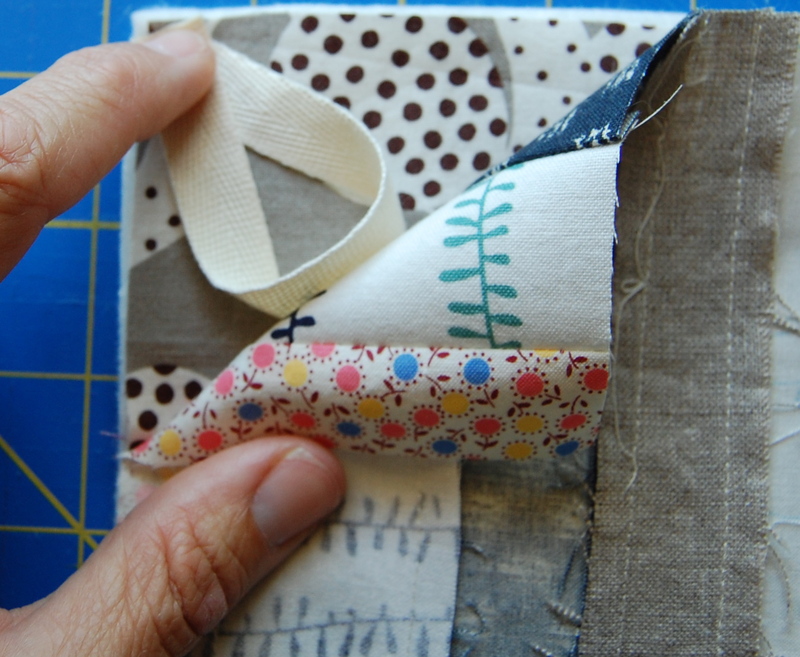 Fold in the fabric at the opening and pin, being sure to catch the pin in both the bottom and top fabric. 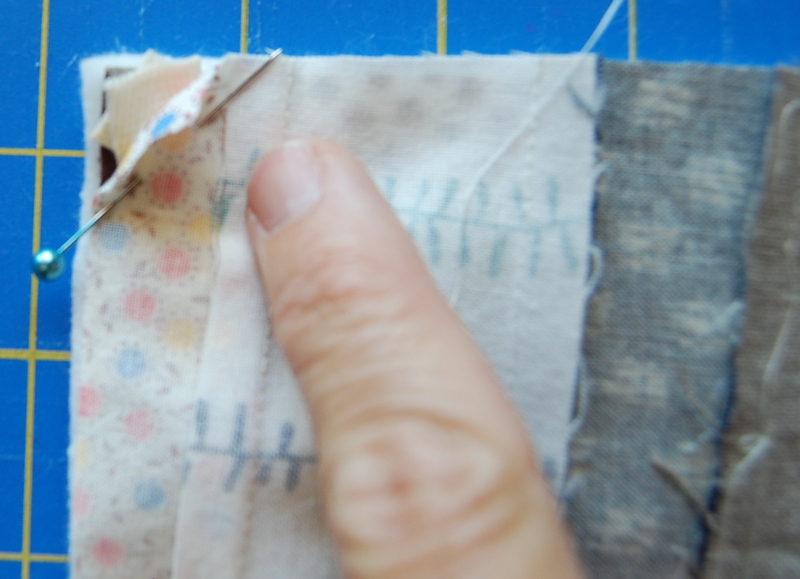 At this point, you can either hand sew your opening shut, add a topstitch along just that side at about 1/8 inch, or topstitch around the entire pad. Here is a sample of one with no topstitching and one with topstitching! 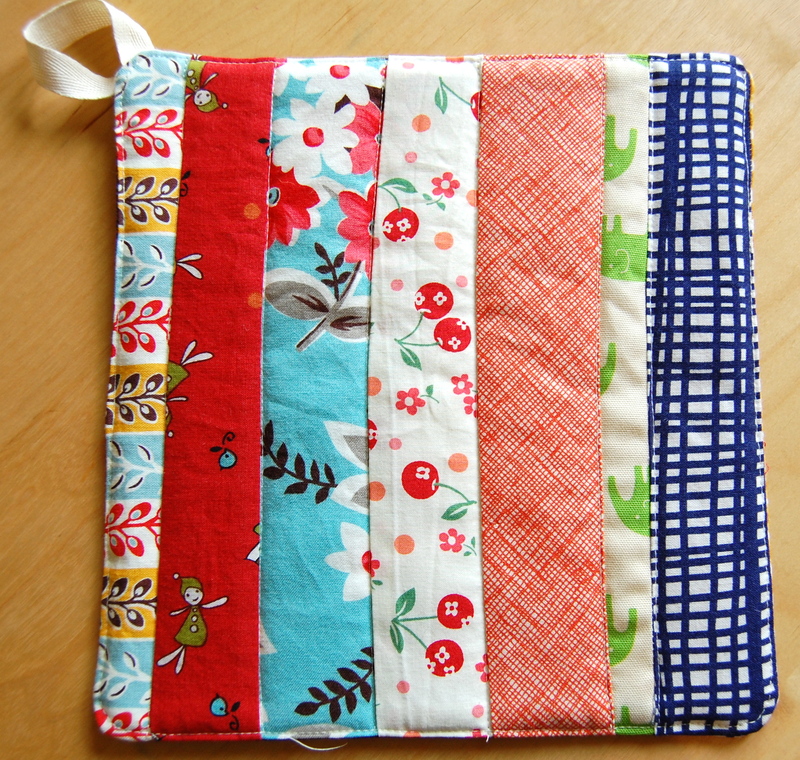 If you like the way this looks and the feel of it at this point, you can stop here and do a little happy dance because you completed your first Scrappy Handmade Hot Pad! Congratulations! 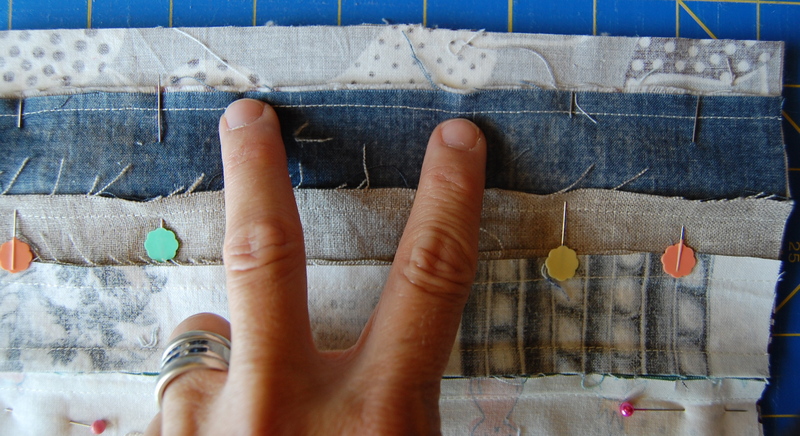 If you wish to add some quilting, go on to the next and last step. Here you can decide how you want to “quilt” your hot pad. 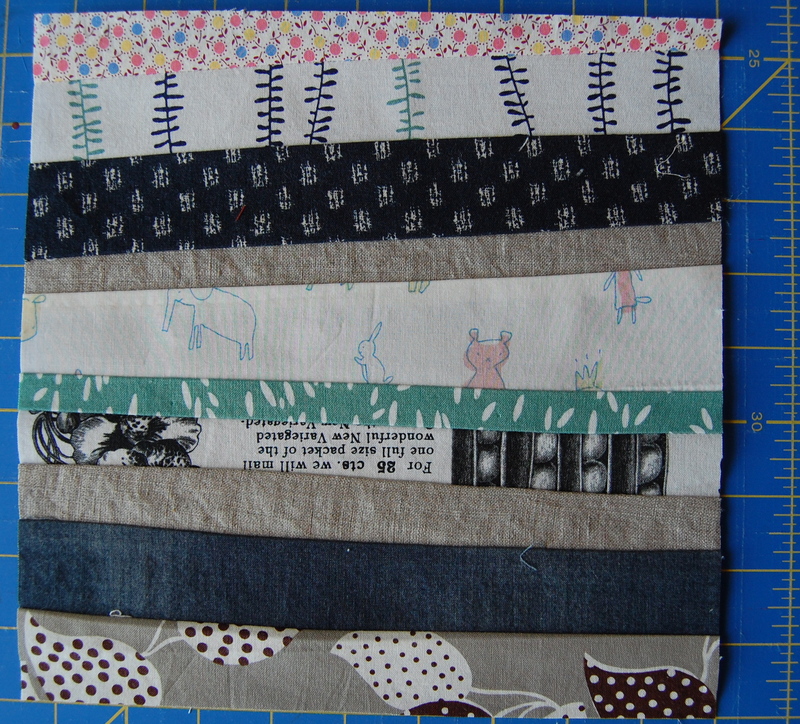 Lots of quilting lines will create a stiffer hot pad and less lines will make it more “bendy” and soft. I chose to make several slightly slanting lines across the strips and on others, I did a simple stitch in the ditch and lastly I tried a little hand stitching. Enjoy your new hot pad/s. I hope you find this tutorial helpful. I’m happy to answer any questions about anything that’s unclear here. To see my original post about the ones I made as gifts for teachers, go here! These are so cute! I will definitely be using your tutorial very soon! Thank you! Thanks! I would love to know how they turn out. Off to your blog now…..
Karen, When I make potholders with Insulbrite I make sure the metal side is under the print fabric, or top. That way it reflects back up when used as a hot pad. It also protects your hands from burns if you grasp the potholder from the back side. Love your posts on scrappy things. I have a lot to use up! What a great idea! 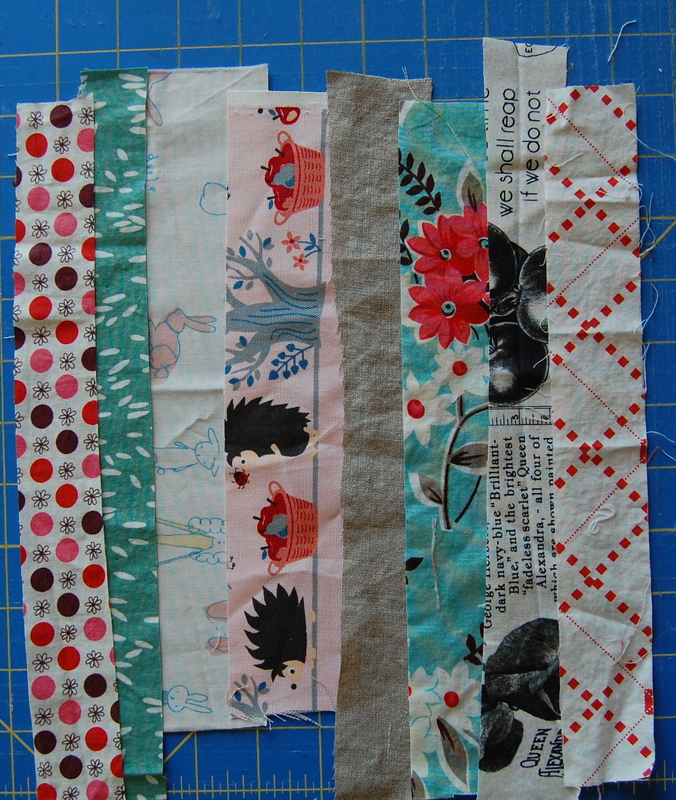 I have soooooo many scraps…these would make good Christmas presents…house warming!! 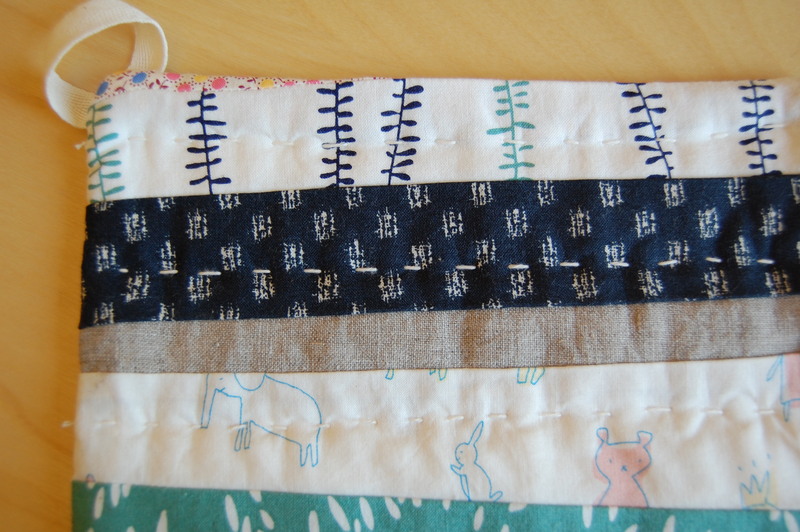 I love I can just skip to the quilting part and not worry about binding! 🙂 And yes, they are so quick and easy that you can easily “freshen” your supply regularly. What a fun little project! Thanks for the tutorial. 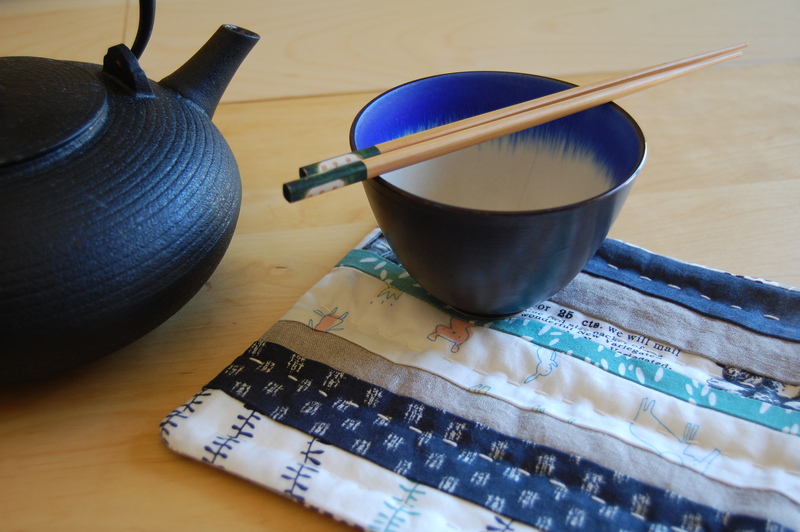 This morning after making my first potholder from this tutorial, I immediately made a grilled cheese sandwich in the toaster oven, and it felt very wrong to use my freshly made “tiny quilt” to remove the hot pan. What kind of way is that to treat a handmade quilt?? lol. Ha!! I felt that way too when I first started using these. I gave one to my MIL and she put it in a frame in her kitchen instead of using them- LOL! I kind of love the idea of something beautiful and handmade being used for nurturing, everyday necessities…… like grilled cheese sandwiches for instance!!! Wondering about sewing the edges closed, with the batting directly on the feed-dogs… doesn’t it shred the batting or leave lots of lint? Great question VB!! I wondered the same thing when I was about to start, but it did not turn out to be a problem at all. 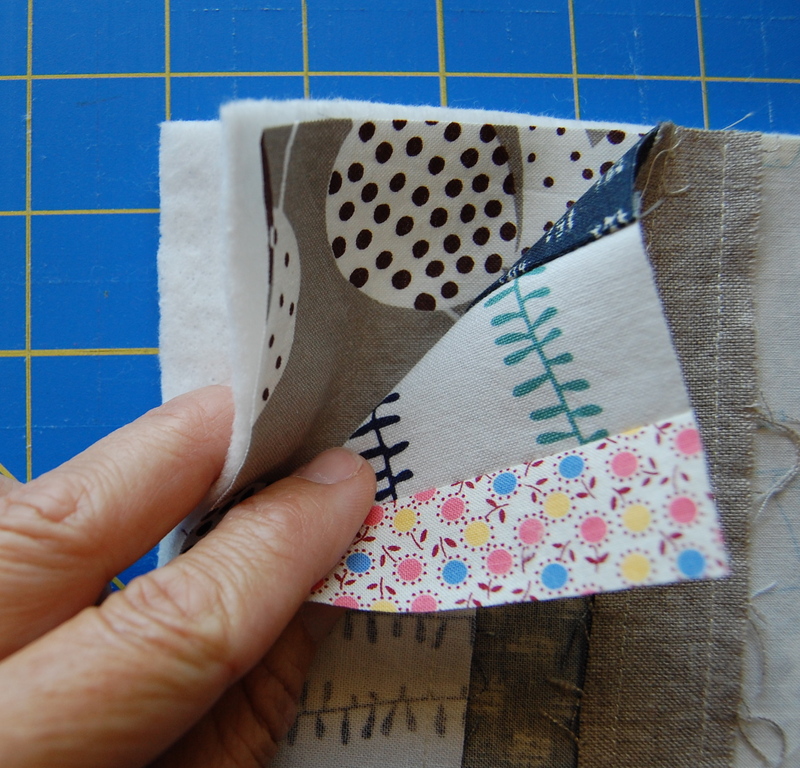 Happy sewing….. Went back and looked at this post a couple of weeks ago. Made three pot holders with some scraps straight away. Love them! These pot holders are great! If you want a nice corner on the finished pot holders (or any other project, for that matter!) 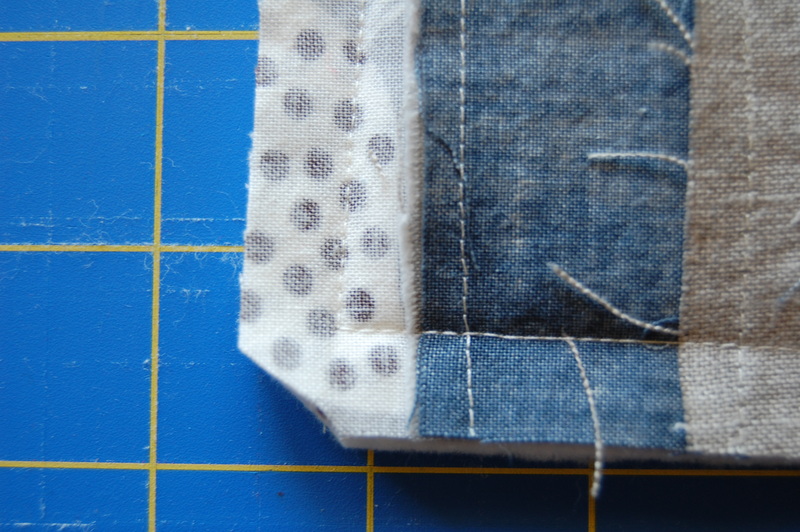 make a diagonal stitch or two at the corner instead of stitching exactly to the corner (square). Trim carefully before turning. When you turn the project right side out, the corners will be sharp! It seems wrong, I know, but it works! Sew on! Awesome! We are going to make these in my FCS class. There are two big boxes of random scraps that we need to put to use. Thank you for the tutorial! Here’s a real beginners question. I made this and at the end did not know whether to topstitch first or quilt first. When you quilt your lines across do you backstitch and those stitiches show up to the edge ? I didn’t want them to let go but then topstitiched over and didn’t like the way it looked at the edges of the material. Def Italy not as nice as yours. Any hints? Or advice? I don’t know if you ever received a response or found how you want to do it, but here’s my two cents on it. I usually top stitch first in this case. Then I start my inside quilting. I do NOT backstitch my quilting lines. I leave the thread long on both sides of the quilting. Then I pull one of the threads from the top to the bottom, knot the ends together over where the thread comes through the fabric. When finished with the knot, I run both end back into the fabric sandwich (usually in the stitching hole) for a few inches before bringing the needle back up. 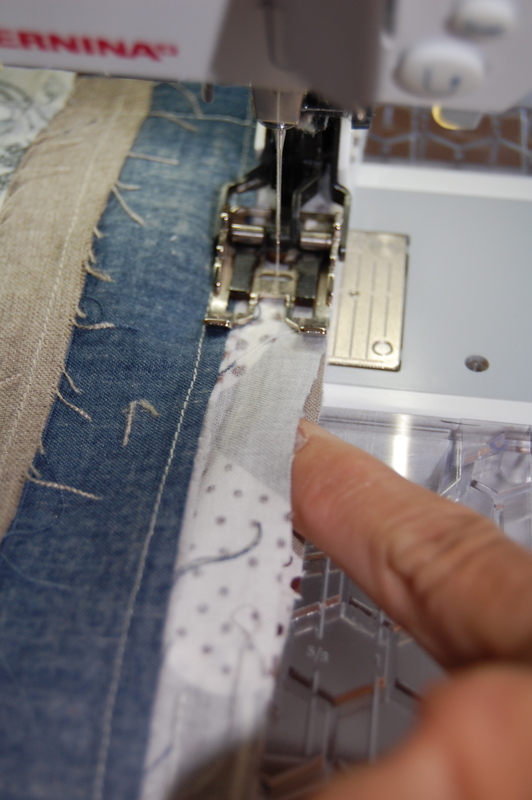 Give it a gentle tug and, if your knot is directly on top of the stitching, it’ll disappear into the sandwich, then pull so that it bunches the fabric a tad and snip close to the fabric so that when it flattens back out, the thread is entirely inside. Repeat on additional ends. It can be time-consuming, but I find it gives me the best results. Wow, Sarah, thank you for sharing. This sounds like a great method for finishing this project off. Thanks for posting your tutorial. I’ve made a couple of the potholders, which came out very cute. I plan on making lots more…they make wonderful gifts. Cute idea and I have lots of scraps. Thinking of Christmas gift ideas. I love making scrap potholes also! I put a later of old thick terry cloth between my batting and put a binding on them…the Terry cloth is usually from old towels that have only the end(s) life left… Nice and thick too! I love your scrappy potholders! I’m going to make some, too! Good tutorial. Thanks. Thank you for the tutorial on the hot pad. Even though I have seen for years I do enjoyed new easy ideas. May God be with you thru your journey of healing . I will say prayers for you for endurance with the pain. Never give up and keep posting . Sewing keeps me going at times. I may not be able to sit as long as I used to, like 2:00 am but I still sew. My sewing group is making Quilts of Valor now for some very wonderful people in our church. 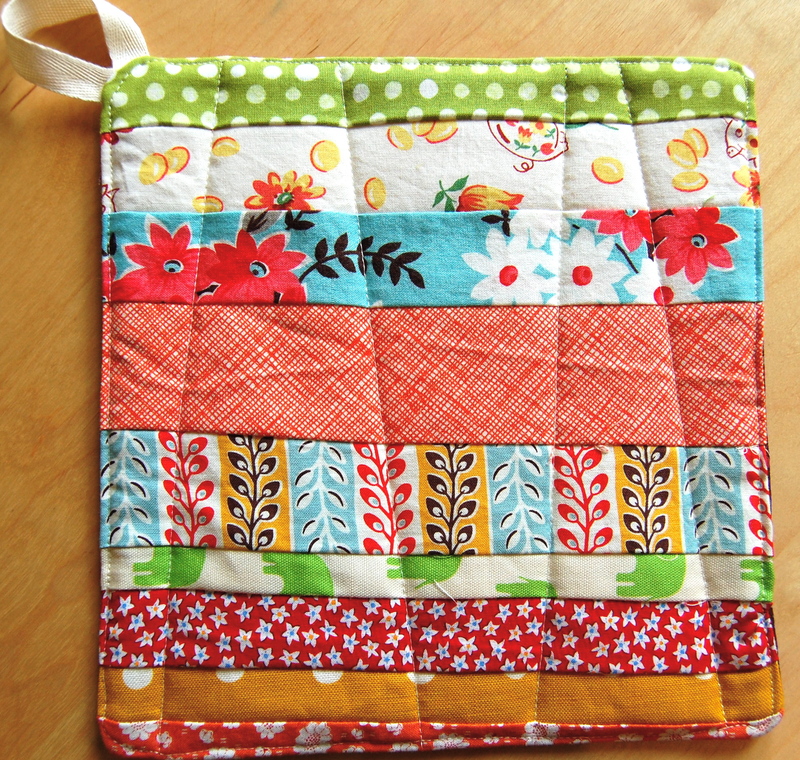 Thanks for the tutorial; it’s a really cute potholder. I’m so sorry that you are having so much pain. I went through 21/2 years of severe pain. I was even in a wheelchair. I want to say that I hope that you’re giving yourself permission to slow down some and rest. It’s needed. Prayers and healthy thoughts. Thanks for the information. I️ will make some for Christmas gifts. Thanks so much for sharing it’s always nice to see what other sewers are doing! Thank you very much! I throughly enjoyed your tutorial on making this adorable pot holders. I hope you are feeling better. I am sending prayers. Once again thank you! where do you get the insulate from? Oh I wish I could order these from you……LOVE them….I don’t sew…Lol!! Just ordered it…..I didn’t see it when I went into the store…..Thank You!! Can you quilt this without a walking foot? Hi Tara…. I think it would be difficult but if you pinned the layers really well prior to sewing I think it could work. wait to try making some. Thank you for doing this for all of us. if I have the skill to do them justice, I’ve been too intimidated to try, but, but!!!! with your tutorial here, and seeing how beauty doesn’t have to be perfect, I think I’m ready to try a Dresden, using this tutorial as a guide and seeing what the sewing gods will!!! If you don’t want to worry about right/wrong side if using insulbrite, do you use two layers of it and no cotton or do you use a layer of cotton between the insulbrite? I thought you were going to do stitch and flip and I was going to have to bind. What a pleasant surprise when I kept reading. Lesson learned … read all the directions for your project first. Lol thank you for the tutorial. I think a lot would depend on the type of broadcloth you’re using. If it’s a more traditional wool broadcloth that is not too thick I think it would work nicely. I would not recommend using any type of synthetic fabric. Hope that helps! Thank you for posting this tutorial. I can’t wait to try this. I hope by now your pain issues have resolved. I just received my second spine epidural last week. I understand chronic pain. Sewing helps to keep my mind busy. Wishing you the best. Precious scrap project! Thank you so much for sharing.